VERO BEACH – On Sunday night, the Indian River County Sheriff’s Office received a call from a mother of a fifteen-year-old girl who said her daughter was with eight men at the Howard Johnson’s located at 1985 90th Avenue in Vero Beach. Deputies arrived at the Howard Johnson’s in Vero Beach and heard what sounded to be a “hotel party” in one of the rooms. They knocked on the door and observed a female appear through the window from inside the room. 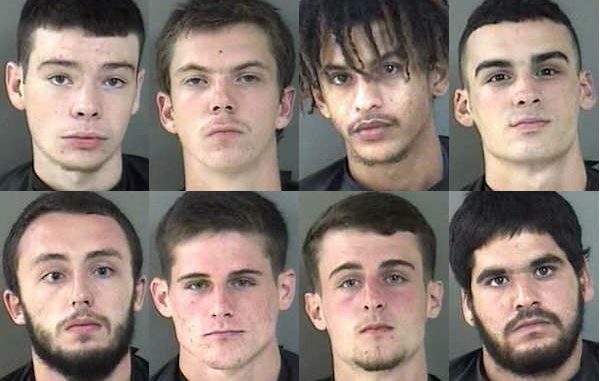 “After several minutes of waiting for the door to open, the door finally opened and inside were eight males,” the deputy said. The fifteen-year-old girl was found hiding in the shower of the room, visibly intoxicated, according to the report. “The room was very smoky and smelled like what I could identify as marijuana through my training and experience. On the floor of the hotel room was two 24 packs of Busch beer cans, cold to the touch,” the deputy said. The deputies also found 25.5 grams of marijuana, MDMA (Mollies), and drug paraphernalia inside the room. A large Vodka bottle was also located in the refrigerator inside the room. All male occupants appeared to be intoxicated. The mother said that a male by the name of Caleb Smith was allegedly serving alcohol and narcotics inside in the room. Inside the room, was 18-year-old Caleb Austin Smith, 19-year-old Michael Raymond Wanzer, 19-year-old Giancarlo Javier Jimenez, 19-year-old Steven Elijah Garcia, 19-year-old Tyler Michael Tetaz-Mongan, 22-year-old Camrin Scott Nason, 19-year-old Drew Allen Nason, 21-year-old Jose N. Borjas. The men were arrested and transported to the Indian River County Jail.